Most Chinese hospitals have at least one acupuncturist and herbalist on the staff and dispense more than 300 different kinds of medicinal herbs. The number of traditional Chinese medicine doctor rose from 150,000 in 1985 to 250,000 in 1995 to 270,000 in 2005, while the number of Western doctors rose from 550,000 to 1,250,000 to 1.7 million in the same period. In 1945, it was estimated that there were 800,000 traditional Chinese doctors in China and only 12,000 Western doctors. 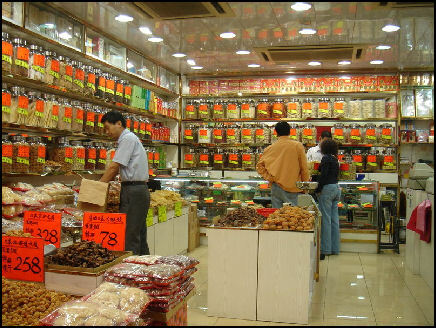 The domestic Chinese medicine market in China is valued at more than $1 billion. Chinese medicine is protected by the Chinese constitution and is covered by national insurance. It is generally cheaper than Western medicine and tends to be relied on more in the countryside among older people in part because of the lower cost. In China, there is a growing interest in traditional medicine among sophisticated urban people as celebrities promote their favorite cures and a number of books, DVDs and website are available. Lectures are organized by companies, health clubs and community centers. Popular dramas such as The Great Royal Doctor, about an Imperial era bonesetter, attract large audiences and bring attention on traditional institutions like the 200-year-old Pingle Style Bone-Setting School. Ton Ren Tang, a 360-year-old apothecary that once served China’s emperors, is now a major Chinese medicine chain with over 1,000 outlets. Chinese medicine emphasizes prevention rather than cure and views the cause of illness as a weak level of energy, which can be treated with a strength-giving restorative medicine. It focuses on "promoting wellness" and treating diseases by locating disharmonies and imbalances and restoring harmony and balance. Agents that cause disease are regarded as belonging to the same universe as the body and treatment is not a mater of killing or getting rid of them but in restoring their balanced place in the universe. 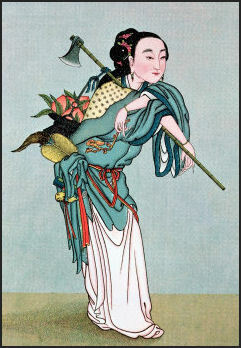 Ma Kou carrying medicinal plants Practitioners of Chinese medicine believe that health is regulated by a rhythm of yin (the passive female force) and yang (the active male force), which in turn are influenced by the "five elements" (fire, water, tree, metal and soil), the “six pathogenic factors,”(cold, wind, dryness, heat, dampness and fire) and the “seven emotions” (joy, anger, anxiety, obsession, sadness, horror and fear). In healthy people these forces are in harmony. In unhealthy ones they are out of balance. Too much or too little food, drink, work or exercise can also throw the whole system out of wack. Many Chinese believe that hip problems can be caused by excessive drinking and hormone imbalances. Disease is believed to be caused when a patient’s qi (pronounced "chee") is too weak, out of balance or blocked. Qi is a "vital force" present thought out the universe that makes life possible. Qi flows through the body along 14 major channels, or “meridians.” The task of a Chinese doctor is make the qi strong by restoring its balance with the universe and harmonizing the internal rhythms of the patient with the rhythms of his or her environment. Medical problems are approached holistically. Knowledge of internal anatomy is not necessary because the body gives external clues for imbalances on the inside. Bonchogangmok According to legend the mythical emperors Huang-di and Shen Nung founded the two main forms of Chinese medicine---acupuncture and pharmacopeia---in 2,700 B.C. through their interaction with extraordinary creatures such as dragons and turtles. Emperor Qin devoted a lot of time, energy and resources searching for an elixir of immortality in the 3rd century B.C. Many of the basic principals of Chinese medicine were laid down more than 2,000 years ago in the Yellow Emperor’s Classic of Internal Medicine. 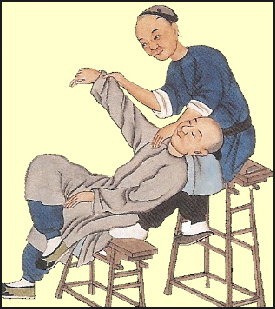 The 7th century physician Sun Dsu-miao is regarded as the Hippocrates of China. He asserted that doctors should treat poor patients just as well as the rich. The medical guide New and More Detailed Pharmacopoeia of Khai-Pao reign-Period was widely in use in A.D. 1000. Marco Polo wrote of rhubarb being used in China as a laxative in the 11th century. Eye drops made from the mahuang plant, which contains ephedrine hydrochloride, were used in China in 3000 B.C. Ephedrine hydrochloride is still used to treat minor eye irritations today. 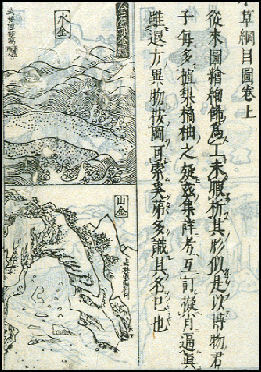 Many Chinese medicine prescriptions come from the Bonchogangmok, a 16th century book on medicinal herbs. A dispensary used by the Qing emperors is patronized by customers in Beijing who use the same medicines as emperors mixed according secret formulas. "Barefoot doctors," who were first sent out into the countryside by Mao Tse-tung after the revolution, used one of the China’s most successful herbal medicines---pumpkin seeds---to rid patients of worms. Today the treatment is also used in Africa to combat snail fever, or schistosomiasis. Treatment by Chinese medicine doctor A Chinese medicine doctor diagnoses a patient by looking into his face, eyes, tongue, ears and nose and by listening to the voice and feeling the pulse and skin. Treatment usually involves acupuncture, qi gong, meditation, dietary changes and herbal remedies. Some doctors look at the face for negative differences in the teeth, hair and ears. The nose is examined for problems with the lungs. Heart problems are diagnosed with the tongue. Liver problems are checked by examining the color of the skin. Some doctors carefully check the iris of the eye. Smell is also important in Chinese medicine, One doctor said, "For example, the smell of a patient who has cancer is different from the one who has had stroke." According to the Discussion on Cold-Induced Disorders by Jan Jung Gyung, written in the Han Dynasty (206 B.C. to A.D. 220), colds are caused by the invasion of Outer Coldness on the body, a process that occurs in six stages. The first stage of a cold, known as tae-yang, is characterized by stiffness of the head and neck, shivers, and a "floating pulse." The second state, yang-myung, occurs when the Outer Coldness infiltrates the area governed by the Stomach Vessel. Symptoms include a dry throat and dizziness near the eyes. Treatment, which is still followed today is based on halting the symptoms at each stage, preventing the next one from occurring. Pulse taking Chinese medicine doctors examine their patients pulses and tongues as Western doctors do but what they usually find is different than what Western doctors find. Chinese medicine doctors have identified more than 30 different kinds of pulses, including slippery, full, floating, rapid, slow, thready, empty, leisurely, irregular and regularly irregular. Tongues can be diagnosed as slippery, dry, pale, greasy, having a thick coating or having no coating at all. 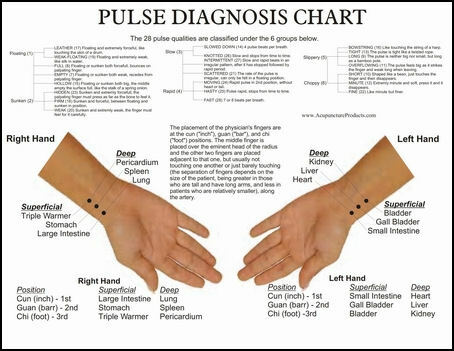 There are 12 different pulses for each of 12 identified major organs. Describing his own treatment, journalist Rick Weiss wrote in the Washington Post, "Ming carried no stethoscope, ordered no tests and didn't tap my knees with a chrome-plated hammer. Instead, he looked at my tongue. Then squeezed my fingernails. Then he felt my pulse at each wrist, sensing not just the rush of blood in my arteries but the subtle pulsing of 12 different signals, unrecognized by modern science, that in Chinese medicine are said to provide information about all the various organ systems in the body." Oriental doctors in Asia are licensed by the government. Universities have acupuncture departments. Doctors and pharmacists practicing Chinese medicine have to attend medical school and pass exams just like doctors who practice Western medicine. A typical conference on Oriental medicine is attended by over 2,000 doctors from 30 countries. Lectures are given by doctors from China, Japan, South Korea and Taiwan on topics like "The Treatment of Cardiovascular Disease with Traditional Chinese Medicine," "Patho-physiological Analysis of Blood Stagnant Syndrome” and the "Evaluation of Efficacy of Bronchial Asthma by Clinical Trials, Laboratory Tests." Some Chinese medicines are more regarded as little more than snake oil tonics. Yet others are remedies that have been used successfully in Chinese hospitals and clinics for hundreds of years to treat a number of maladies. Only recently have Western doctors begun to study Asian medicines with carefully controlled studies. In September 2002, 1,500 researchers from 28 countries presented more than 1,000 research on traditional Chinese treatments, most of them using Western research methods. The research found that Chinese medicine is most effective treating chromic ailments such as digestive disorders, recurring migraines, menopausal symptoms. in which Western medicine is the most ineffective. The study of Chinese medicines is difficult because remedies are often blends of several herbs. Western medicine was introduced to China in the 16th century by missionaries but for centuries was merely a curiosity. In the 19th century missionary hospitals became more widespread as Europeans increased their presence in China. Many Chinese refused to use them in part because of rumors that were spread about Western doctors harvesting organs from patients and storing them in churches and using children’s hearts in black magic rituals. Western medicine won some respect in 1894 during an outbreak of the bubonic plague, a disease that Chinese herbal medicine was powerless in combating. Dr. Haruki Yamada of the Oriental Medicine Center of the Kitasato Institute in Tokyo said, "Western medicine is very important and efficient for the treatment of many diseases but it is not perfect. Oriental medicine can cure diseases that cannot be covered by Western medicine. Using both types can be very useful depending on the disease." The World Health Organization is currently researching Asia medical system. Many doctors in Asia try to use the "three roads" approach to medicine: Western medicine, Oriental medicine and a combination of the two. If a Chinese man or woman becomes ill often he or she will seek out a doctor who practices Western medicine and one who practices Chinese medicine. According to one doctor, "traditional Chinese therapies are applied for better treatment and recuperation results." Still there is little evidence that Chinese medicines can be used to cure serious diseases like cancer and heart disease. Some hospitals, like 304 Military hospital in Beijing, have an east wing for Chinese medicine and a west wing for Western medicine. People with chronic ailments like arthritis and back pain are directed to the east wing. Those with acute problems like a heart attack or a broken leg told to go to the west wing. Oriental medicines are becoming increasingly popular in the West. A third of all adult American males have seen a doctor who practices oriental medicine. Oriental medical doctors have been sent to Ethiopia, Gabon and Kazakstan to help ailing poor people. These days critics of Chinese medicine within are becoming more and more vocal. Some claim that the medicines are ineffective and dangerous because they are sometimes used in lieu of Western medicines that are effective and sometimes contain toxic substance. 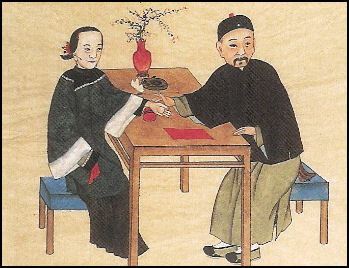 Some have compared Chinese medicine to witchcraft, with practitioners killed at offering excuses why it doesn’t work. . Other want to Chinese medicine stripped of its protected status by the Chinese constitution, require pratcitioners of traditional medicine ro receive Western training and traditional cures undergo thorough Western-style testing. As a rule alternative medicines---including Chinese medicines---have not been studied as carefully or put through the same kind of scrutiny as modern medicines. Those that have been studied have often been done so with dodgy science---namely small sample sizes and lack of control groups. In the United States, the National Center for Complementary and Alternative Medicine (NCCAM) has a $122 million budget to study alterative medicine with rigorous methodology in cooperation with the National Institute of Health (NIH). The trials are longer and larger and if one treatment shows promise it is studied more carefully, which is the usual pattern with modern medicine. In the United States and Japan several Chinese medicines and herbal cures have been banned after being linked to several deaths, In the United States ephedra was banned after it was linked to heart attacks and strokes. See Japan. Some treatment contain heavy metals, other arsenic and mercury Practitioners of Chinese medicine have said the problem was on eh dosage and incorrect application not o je drug itself.